Eight awards were presented to filmmakers at the conclusion of the highly successful 2013 Sun Valley Film Festival, presented by Zions Bank. Winners were announced at the Alaska Airlines Closing Awards Ceremony. The Vision Award was presented by Academy Award®-winning actress Jodie Foster and recognizes the producer's ability to keep a feature length narrative in focus during the journey of the project. This award honors feature length stories made for under a million dollars. One narrative and one documentary film were recognized. The SVFF Audience Award is the voice of the Valley and was selected by audience text vote. Zions Bank presented this $1,000 award to the Idaho filmmaker whose work best reflects the beauty and diversity of the Gem State. The Young Filmmaker Award was presented to best film helmed by a student under 18 years old. Best Short Film goes to the best short story film, no matter the genre or aesthetic. This award recognizes the top music video, a webby, a sizzle reel, or a short film. 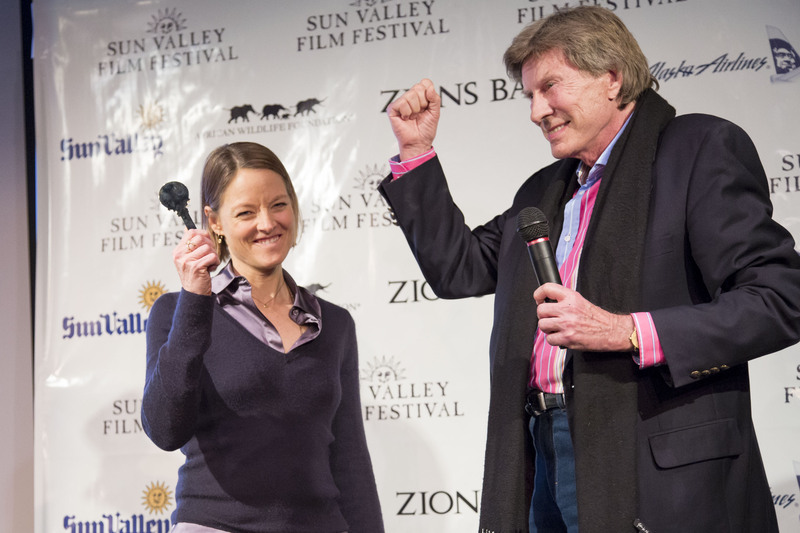 In a surprise addition to the Closing Awards Ceremony, Academy Award®-winning actress Jodie Foster was presented with a key to the City of Sun Valley by Mayor DeWayne Briscoe. In the presentation he noted Foster has contributed significantly to the growth of the Festival and helped put it on the national radar through her participation this year. “We all appreciate your support of this community and honor you with this key to the city,” he remarked. The 2nd annual Sun Valley Film Festival, recognized as one of the Ten great places for a fabulous film festival by USA Today, nearly doubled its ticket sales this year and organizers are calling the event another tremendous success. An estimated 2,500 people came and enjoyed great indie cinema, sunny spring skiing and Sun Valley’s famous hospitality. The 2013 Festival featured a curated slate of over 60 cutting edge films and TV premieres, engaging coffee talks with industry insiders like Hollywood legend Jodie Foster and Academy Award®-winning writer Stephen Gaghan, parties with top entertainment including indie rock legends Built to Spill, a Screenwriter’s Lab led by Independent Spirit Award nominee Will McCormack, and the Alaska Airlines Closing Awards Après-Ski Ceremony. This March, filmmakers from around the world brought their vision to the Sun Valley Film Festival and movie lovers enjoyed watching it come into focus. For Festival details: http://www.sunvalleyfilmfestival.org. Get Festival updates on Facebook and Twitter. The 2013 Sun Valley Film Festival is presented by Zions Bank. Major sponsors include Alaska Airlines, Nat Geo WILD, Sun Valley Resort, Tito's Handmade Vodka, SVPN, and InkTip. Jodie Foster receives key to the city from Sun Valley Mayor, DeWayne Briscoe.